Have you ever attended a birthday party and noticed the punch that looked like it had foam over the top of it? Or even the punch that has huge ice cream balls in it? They all look so delicious to me and they are always so refreshing. One thing that always bugged me, though, is that all the recipes I found online where to make the huge punch bowl size, instead of an individual pitcher like I was hoping to find. After tons of googling and not finding what I needed, it was time to go on a short conquest to make the perfect Hawaiian Sea Foam Punch (Virgin). This drink is very easy to make and is perfect for a hot summer day. Best of all, you don’t have to call over all your friends and their relatives to drink it all. Of course, if you wish, this drink can be doubled or tripled to be served at a party. If you have younger kids, let them pull up a chair and help make the “foam”, they will surely get a kick out of that! You can make the drink ahead of time, but wait until you are ready to serve to add the “foam”. Mix it up with different flavours. Having a party? 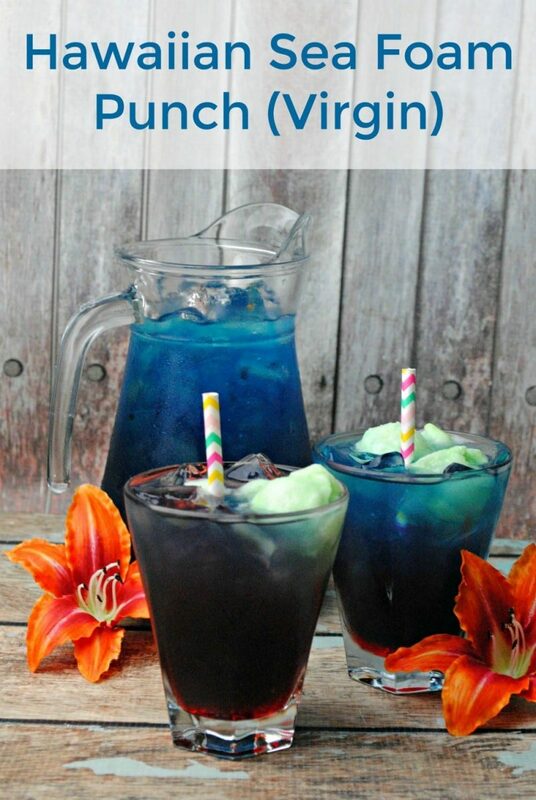 Use a drink colour that corresponds with the party theme. I hope you enjoyed my Hawaiian Sea Foam Punch as much as my family did. If you make it, make sure to share with us on Facebook or Twitter! Also, check out all of our other Recipes. This sounds really, really good!!! I will have to try it!! Such a pretty blue drink an sound delicious, it was the sherbert that got me. Does this ever look tasty! and pretty! and a great addition to a bbq gathering! This would be delicious with vodka! I am quite sure my kids would LOVE this drink, such a special idea! Yes, and it’s great for kids of all ages too! This looks so good . Will try it this summer maybe with a splash of rum lol. Thanks for all the awesome drink recipes . This juice sounds yummy and I use yummy for anything sweet like desserts. The only thing I would do different is remove the “virgin” aspect of your recipe and add vodka which is my alcohol of choice. Oh,I certainly would love to try this!